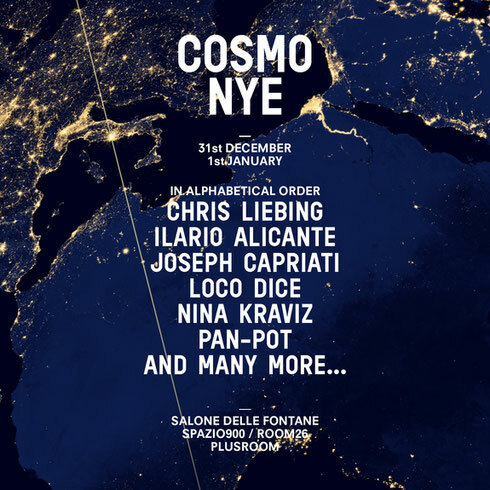 Returning for a second consecutive year following a debut event to ring in 2016, Italy’s Cosmo Festival has now confirmed its line-up for its sophomore edition in Rome. Apparently set to perform in front of up to 10,000 people, the line-up includes Chris Liebing, Joseph Capriati, Loco Dice, Nina Kraviz, Pan-Pot and Ilario Alicante, with more to be announced in the coming weeks. The event, which spans both New Year’s Eve and New Year’s Day, ending at 4am on 2 January, will take place across four different indoor venues, all within 100 meters walking distance from each other. Partygoers will have access to all of these venues throughout the duration of the event. Hailing from Frankfurt, Chris Liebing is the driving force behind imprints CLR and Spinclub Recordings. With a long-standing weekly radio show also to his name, Chris will be heading to Rome at the end of the year for his Cosmo NYE debut. Joining him will be fellow compatriots Tassilo Ippenberger and Thomas Benedix – aka Pan-Pot. Having shot to prominence over the course of a decade, this duo possibly reside in the upper echelons of electronic music, known for their productions and live performances. Next up is label boss, Nina Kraviz, who will be joining proceedings as she prepares to bring her acid-tinged soundscapes to Rome for her first Cosmo outing, and Joseph Capriati, who has apparently established a reputation as a popular talent. Representing Italy at the event, Capriati will be joined by Tunisian-born regular Loco Dice, whose discography spans imprints such as M_nus, Cadenza, Ovum, Four Twenty and Cocoon. Having made his Timewarp debut at the age of just 15, German producer Ilario Alicante completes the first phase.